I usually find signs that I like when I travel to foreign places, especially if the populace has a less than perfect command of English. I’m sure that the locals were wondering why I was taking picures of the mundane icons that are filtered out of their focus. My choice of subjects to photograph most likely flagged me as a tourist, to the locals who were trying to get me to purchase their assorted omiyage. Okinawans are a true breed of hustlers, and it was painful watching my companions getting fleeced. But that’s the topic of a separtate post. “No way!”, “Ouch!”, “Has to be two different sets of teeth!”, “I wonder if the same set of pictures accompanied by English appears in England?”, and “That dentist must be a friggin’ god/butcher!”. I have seen some pretty bad teeth in Japan, but many people are now wearing braces and taking better care of their teeth than before. This picture makes me cringe when I think of the pain that the patient had to endure. How many cc’s of lidocaine was injected into that gaping maw? 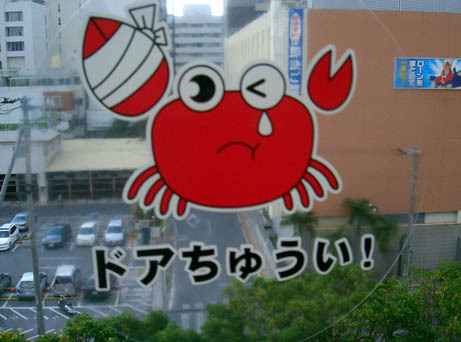 This next picture is the Japanese equivalent of the French Metro Bunny. On a side note, I feel responsible for contributing to the widescale spread of American tourists stealing those stickers. In 97, after returning home and showing a friend the mementos of my trip, he thought it was such a cool sticker that he did it, and everyone else who went to study abroad with Orange Coast College that year followed suit. It became a tradition, and soon there was a shortage of stickers on the metro (and a sharp increase of people getting their hands caught in the doors, I like to imagine). So this time, instead of stealing a physical copy, I captured one on my camera. 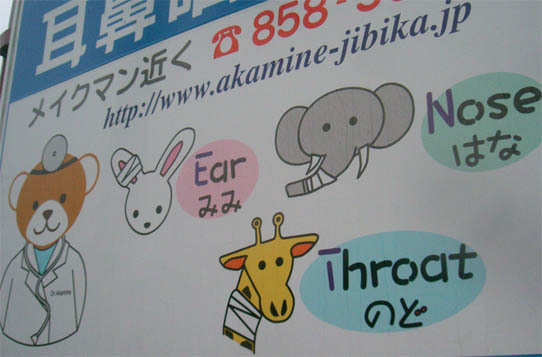 If I had a problem with my ears, nose, or throat, this is the doctor I would want to go to. For some reason, these images evoke a feeling of trust for this doctor, even though I have never met him. This last sign was taken in the domestic terminal of the Okinawa Airport. I understand the need for explicit directions, but this goes a bit further than necessary. I mean, did someone try to argue “but officer, I didn’t know that it was wrong to stash my guns and drugs on top of my bag filled with decomposing decapitated heads that I was using to feed my pet weasels. Oh and don’t worry, the pipe bombs aren’t really dangerous because I didn’t insert the fuses yet. You know, someone should really put up a sign to make it clear just what exactly IS acceptable to keep in these lockers! They didn’t seem to mind up in Kansai.”? Awesome! Yo, let’s climb Neko dake on some free weekend. Bring back some SARS (and maybe a few good stories).